"Dominion Theology is the idea that Christians should work toward either a nation governed by Christians or one governed by a conservative Christian understanding of biblical law." Kim Davis, the Rowan County Kentucky Clerk in charge of marriage licenses, has now been rebuffed by the U.S. Supreme Court for her refusal to issue marriage licenses to gay couples, and commentators in the mainstream press are beside themselves at her dumbness. It ain't dumbness, folks. It's bravery, however pretzeled by a fanatic religious belief. Kim Davis is meditating every second of every day on Matthew 5:11: "Blessed are ye, when men shall revile you, and persecute you, and shall say all manner of evil against you falsely, for my sake." She's divinely right on gay marriage, and everyone else is wrong, everyone on up through the justices on the U.S. Supreme Court. She's now willing, I would venture, to go to the stake over this and have the flames rearrange her hairdo. 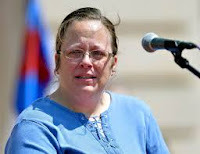 Every court ruling against her, every insult broadcast on the Internet, every sidelong sneer she's now experiencing from some of her fellow Kentuckians -- all of that is just proof, according to Matthew 5:11, that she's a righteous soldier in the army of Christ. It's the same type of faith that bolstered many a martyr to their deaths in all the centuries of stupid religious wars -- martyrs of every sect, of every warped or blessed belief. You will not shake them, shatter them, nor move them off their rigid platforms of surety. Now comes word this morning that Governor McCrory has agreed to be a featured speaker at a Christian dominionist rally in Charlotte. His image was being used in a full-page Charlotte Observer ad to promote the event, and words were attributed to him thusly: "Come Join Me in a time of worship, prayer, fasting and repentance." "Repentance"? For the group hosting the event, The American Renewal Project, that word implies a good deal more than some benign regret for sins of commission/omission. As to the future of America – and the collapse of this once-Christian nation – Christians must not only be allowed to have opinions, but politically, Christians must be retrained to war for the Soul of America and quit believing the fabricated whopper of the ‘Separation of Church and State,” the lie repeated ad nauseum by the left and liberals to keep Christian America – the moral majority – from imposing moral government on pagan public schools, pagan higher learning, and pagan media. That's relatively explicit. They intend war (folks die in war). They intend to "impose" their version of holiness on the rest of us (and what ensues when one of us resists the imposition?). Resistance is futile, O my brethren, because these guys speak for God, and we assume that God is ordering them toward their vision of "victory." Do you want to go with them there? Evidently, Gov. 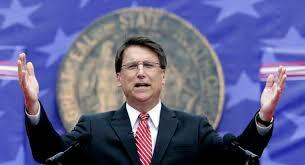 McCrory either didn't read the brochure, or he's fully aware of who he's throwing in with. Curious minds want to know. Governor McCrory is a nitwit. He ought to be impeached for speaking to this group. As for the lady in KY, how would it be different if she was black, or muslim? Think about it. If Republicans want war, they'll have a local one if they can't remember separation of church and state. John Blake: What is "separation of church and state" exactly, and where did this term first appear ? That question of yours, anon, is obviously not sincere, since I suspect you've got your pre-written rejoinder all ready to go, but I'll do the obvious and quote the 1st amendment: "Congress shall make no law respecting an establishment of religion, or prohibiting the free exercise thereof..." That prohibition on Congress specifically was extended by the Supreme Court in 1925 to apply to all levels of government in the states, and in 1947, in Everson v. Board of Education, the Supreme Court quoted Thomas Jefferson's opinion for the first time that there should be "a wall of separation between church and State." Add to that a 200+ year feature of the "American personality" -- we as a culture do not like preachers of any stripe or of any belief demanding that the rest of us share in a particular religious observance. Which is why so many churches have splintered over time. Why are there so many different flavors of Baptist? Because -- don't try to tell me what to believe! Especially if you represent some level of civil government. Could get mighty interesting. Though I wouldn't expect the governor to cough up those emails before snow flies ... in 2016. Thanks, Oh Suzannah, for your explanations. You spoke of the Supreme Court quoting Jefferson's opinion that there should be "a wall of separation between church and State." Just where did Jefferson get that particular phrase from, and was this phrase his original quote? Was Jefferson quoting someone, and what was the issue that started the controversy? Anon, how bout you take charge of your own education and do a little Googling? It's pretty easy. And there's a wealth of on-line resources, including those offered by the "This Is a Christian Nation and You'd Better Get Used To It -- Or Else!" crowd. Oh Suzannah, I'm with you all the way! I applaud your being many steps ahead of "Anonymous"... Especially with "how about you take charge of your own education & do a little Googling?" Anonymous came through loud & clear as one who demonstrates no critical thinking skills, & who clings to his ideology, despite facts. You will never defeat the Dominionists through peaceful means. They will never give up, and they will never go away on their own. Dominionism is a clear and present danger that needs a more proper response: Confrontation. What is needed to confront Dominionism head on and defeat it is a body, an organization of like-minded people who understand this danger and is willing to come together to stop it. It needs to be a movement against Dominionism, with teeth, willing to scrap with Dominionists head on, eye-ball to eye-ball and feet to feet, uncompromising, unmerciful, and with the gumption and will to do what is necessary to stop them. The Dominionists are at war with Secular America. It is time that people clearly understand that and act accordingly. We need to go to war with our enemy: Dominionism. Kathy and Suzannah, I refer you to a very pertinent tract written by Chris Cantwell. You can find it on Lew Rockwell. "Jailing her was an extraordinary measure designed to do a single thing – to terrorize America’s religious majority." Stopped reading right there, I've seen enough to know how the rest of this story goes.